You’re driving through the dragon fruit orchards or coasting along the otherworldly riverside coconut plantations, the Mekong Delta is the perfect place to catch a breath of fresh air and enjoy the picturesque countryside, not to mention all the amazing dishes you’ll get to enjoy... no one ever comes home hungry or empty-handed! Head towards a local Vietnamese shop with a diverse menu of noodles boasting dishes from all over the country for breakfast. Choose your favorite one! Upon arrival at the Mekong, we will board a private boat and explore the different islands along the river. - Coconut processing plant where you also get to try yummy coco candies! You will get to taste all sorts of local flavors for lunch and enjoy fresh coconuts and hammocks. You will get back on the river, but this time on a small rowboat. 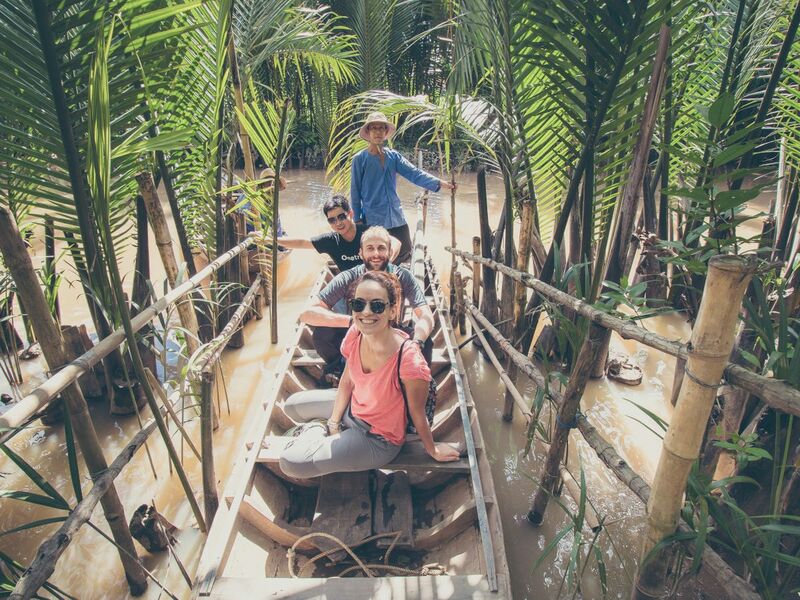 Enjoy the peaceful countryside river life as you paddle your sampan through the palm-tree lined canals. Towards the end, our boat will pick us up again and we will cruise back to the boat landing in Ben Tre town. Arrive safely at your accommodation.